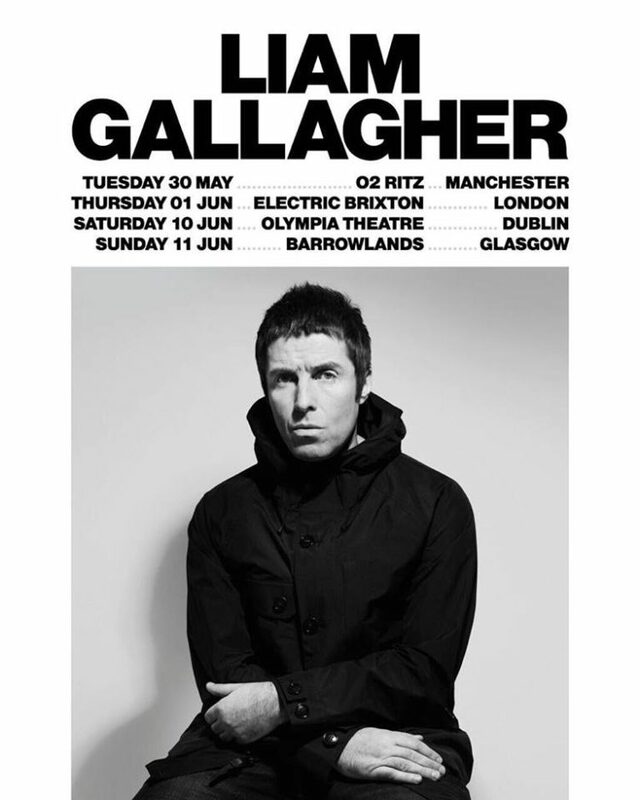 “This is another new one, sorry about that” Liam Gallagher, Ex-Beady Eye frontman and Ex-Oasis star sniggers to the crowd of the O2 Ritz in Manchester. He shrugs his shoulders in his Pretty Green mac, wipes the sweat from his forehead and launches into a solo song of his. The crowd do not appreciate Gallagher’s new music as much as the old, but if you bought a ticket to hear ‘Wonderwall’ and ‘Champagne Supernova’ then you should’ve done yourself a favour and quit while you were ahead. He isn’t resurrecting Oasis; he’s paving the way on his own. Gallagher’s first solo-outing showcased his voice in its prime. Gone is the wheezing, the rasping and general flat tone. Replacing poor is flawless. Chugging water on stage, you can see the concentration spread across Gallagher’s face and hear the rejuvenated voice echoing from his lungs. Heavy, rich and blossoming – this is the second coming, as The Stone Roses said. Opening with Oasis classics ‘Rock N Roll Star’ followed by ‘Morning Glory’, Gallagher gently slides into his comfort zone, before blasting out his first ever solo single – ‘Wall Of Glass’. “I don’t mean to be unkind/but I’ll see what’s in your mind” Gallagher sings perfectly in tune. With no fault, LG looks at ease on stage as he peers out into the crowd. Whoops, and hollers followed by nodding heads and raised arms greet ‘Wall Of Glass’. Ties are cut from both of Gallagher’s former bands as the song nears its death-defying end and we begin to doubt ourselves and our idea of Oasis. Because really, hasn’t Liam Gallagher always been a solo artist in his own right? He’s always been the star of the show; we just haven’t needed to notice until now. His new songs pack punches and show that he’s working with a top production and songwriting teams. It doesn’t matter that LG might not be writing the tunes, his direction, his voice and his stage presence is what matter. Ending on a high, Gallagher brings out Bonehead from the guestlist balcony area to play the guitar for him like the old days. The lights go dim and the crowd hound for more. Gallagher knows how to play the crowd, feed them what they want and then leave them hanging on for more. He swaggers back on stage with pure courage and commitment before launching into an acoustic version of ‘Live Forever’. Acoustic because, apart from a shaker, the only sound resonating from the stage is Gallagher’s voice. It is simply breathtaking: a moving spectacle. Although a girl shouts “play ‘Wonderwall’”, but honestly, we don’t want him to. As a collective crowd, we’ve realised that Liam Gallagher will always be Oasis and will always play Oasis – but he’s Liam Gallagher, solo artist. Tonight has cemented the future.